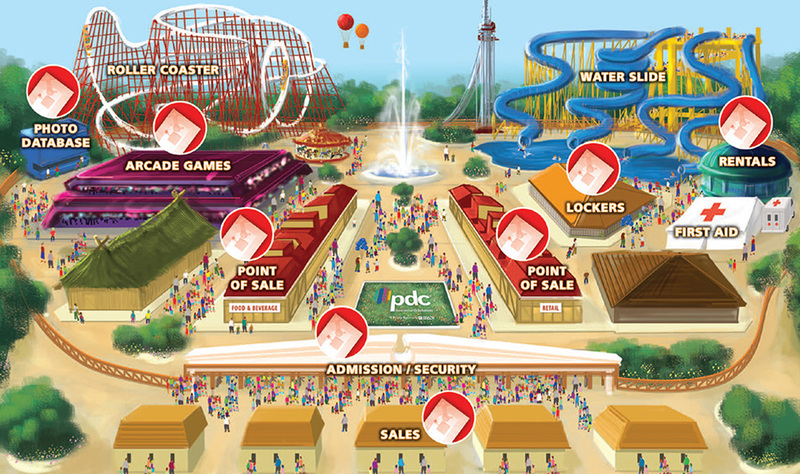 As the innovator of the RFID wristband system, with over a decade innovating and deploying PDC Smart® RFID systems worldwide, PDC has earned its reputation as the leader in RFID wristband solutions. Our dedicated RFID Solutions team is available to provide any range of services you need to get your RFID program up and running— from consulting and planning to implementation, staff training, and on-going support. How can RFID enhance the guest experience and add to your profits? Which applications make the largest positive impact on your customers and staff? PDC will ask the right questions and help shape the solution that best meets your unique needs. It’s impossible to recommend a sound solution without experiencing your vision first-hand. PDC’s experienced team will evaluate your site and operation from top to bottom to define your unique use models and determine the correct mix of hardware and application features. Throughout the development process, PDC’s focus is to maximize performance and profits by selecting system components that economically and technologically meet the needs of your application. Through many years of experience, PDC has built a diverse, reliable partner network with the nation’s leading RFID application, equipment, hardware and software suppliers. These relationships allow us to develop and properly implement your customized solution. Successful integration of any RFID application requires effective project management. PDC’s skilled project management team guides the installation from development to execution. Project and vendor management, on-site installation supervision, staff training, and ongoing services and support ensure an efficient and functional RFID solution. PDC serves your needs today and develops the RFID applications and services for tomorrow. Let us explore your visions and determine the value proposition for a variety of new RFID enhanced applications, such as interactive displays or rental programs. Guests don’t have to carry anything on them. There’s no need to worry about keys, wallets, or cash. When you go swimming, you can’t put these valuables in your pocket and you don’t want to leave them behind at your chair. Everything’s on the wrist! You can’t get more convenient than that!